Ludo Kingdom™ – The Best Free Board Game played with friends, family and kids. Download new Ludo Board Game Download App for free 🆓 and be a child again & Refresh your childhood MemoriesLudo has its roots in ancient India. The Spanish version of the Ludo game is called Parchís. Ludo is similar & derived from the Indian game Pachisi. We brought the same excitement in a digital application.Install & Play Ludo Kingdom™ with your family 👨‍👩‍👧‍👦 or friends or kids. Lets roll the dice 🎲, score high & make your best move with Ludo Kingdom™!What’s New in Ludo Kingdom✦ 29 Global Languages✦ Chat with friends & opponents✦ Challenge 🤜🤛 friends✦ Great online 🌐 connectivity 📶✦ Easy, user friendly Interface✦ Ludo Supports low end devices 📱✦ Error free & Advanced Ludo Game 🎲Features of Ludo Kingdom✦ No Internet connection required!✦ Play Ludo Game with family 👨‍👩‍👧‍👦 & friends✦ Play among 2 to 4 Players in Local Multiplayer Mode✦ Online Multiplayer ⚔️ Mode with 12 challenging rooms✦ Invite & challenge Friends 🤝✦ Play with players worldwide 🌏✦ Private chat with friends & opponents✦ Tease/show emotions by emojis 👊✦ Popularly accepted & played Ludo rules✦ Clean & simple user interface with elegant Graphics★★★KEY HIGHLIGHTS OF LUDO KINGDOM★★★✴ 29 International Languages- First Ludo Game Localised & offered in 29 Languages- Play Ludo Kingdom in the language you are comfortable with.- Languages offered.Englishहिंदी (Hindi)中文 (Chinese)Español (Spanish)Bahasa Indonesia (Indonesian)Pусский (Russian)日本語 (Japanese)Tiếng Việt (Vietnamese)Deutsch (German)Français (French)Italiano (Italian)	+18 More Languages✴ Elegant Graphics- This LUDO has Clean and simple user interface with traditional theme. Really elegant!✴ Game Modes- Computer/AI Mode – Offline Mode where you can head to head with the game’s AI- Local Multiplayer Mode – Play Ludo with local friends on the same device. 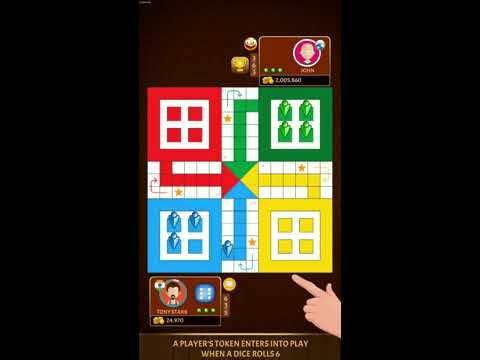 This is most popular and really an addictive Ludo Mode!- Real-Time Multiplayer – Opportunity to play Ludo online, with global players- Private Multiplayer – Other online Ludo Mode that creates a private room & play Ludo game with friends✴ Gameplay- Fast paced Ludo game – Use ‘Fast Move’ option to save plenty of time- Get notified about ‘Your Turn’ by a short burst of vibration- Send Emojis and Smileys to opponents in Online Ludo Multiplayer Mode- Get 25,000 virtual coins by installing the Ludo game.✴ Color choice ❤️💛💚💙- Choose your favourite Board color – Red, Blue, Yellow or Green✴ High User flexibility- Switch On/Off “Fast Moves”- Switch On/Off “Game Chat” – Switch On/Off “Game Smileys/Emojis” – Switch On/Off “Vibration”✴ Private Chat 💬- Play Ludo game & chat privately with your friends or global players.- Ludo Game chat can be used to chat like other Social Networking chat applications.- A great opportunity to make new friends using the Ludo Game chat option. Play, Chat, Meet or Date with opponents- Completely private, confidential and secured chat with end-to-end encryption- Allows – Accept, Reject or Block users✴ Leaderboard 🎖- LUDO Game Leaderboard keeps a track of global ranking✴ Player Statistics 📊- Check 👀 opponent’s statistic to build your own strategy to win the Ludo game.- Loads of opponent statistics enabling you to strategise your Ludo game.- Create your personal profile/game career.- Creates Ludo profile using – Facebook Login or Guest LoginFollow us on:* Facebook: https://www.facebook.com/LudoKingdomGame* Website: http://www.ludokingdom.in/LUDO KINGDOM™ PUBLISHING RIGHTS RESERVED WITH QURIOUS GAMES AND QURIOUS MEDIA.